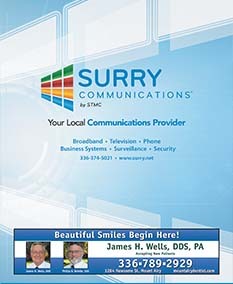 Surry Communications is a local company headquartered in Dobson, with additional locations in Elkin, Mount Airy, Pilot Mountain & Lexington, North Carolina. We provide Telephone, Internet, Television and Security monitoring for businesses and residential customers. STMC started in 1951 and today continues to invest in the latest technology for our customers. Surry offers cutting edge services including our Fiber to the Home initiative that delivers voice, data and video directly to your home or office. A group of local people carried a great responsibility on their shoulders when they met on Feb. 6, 1951. Technological and social changes brought about by the Great Depression and World War II made the world a different place. Methods of communication needed to be better and faster even among the farms and quiet towns of the North Carolina Piedmont. That Tuesday, they set in motion the wheels that would carry Surry and surrounding counties into the future. Sixteen years earlier, Congress had established the Rural Electrification Administration (REA) in order to extend electrical facilities to rural America. In 1949, the REA was amended to assist in bringing telephone service to those same areas. REA made start-up loans that allowed rural cooperatives to build their own service lines, providing the co-ops could prove they had strong community support and a sound operating plan. The first board of directors meeting in 1951 adopted the by-laws that guide STMC’s business operations. They adopted the corporate seal, set residential and business multi-party rates, and took all the steps necessary to apply for a $595,000 REA loan through the North Carolina Rural Electrification Authority. The Surry Communications received its Charter of Incorporation from the state of North Carolina that same year. It began operation with 192 members in the Level Cross Exchange in November 1954. In 1957, Westfield, Beulah and Zephyr exchanges were added, bringing the number of subscribers to 1,100. The monthly rate for 8-party service was $3.25, with toll charges on calls outside the member’s own exchange. Surry Communications started the 1960s with a new location. In 1961, STMC moved to new headquarters on South Main Street in Dobson, where it stayed for 20 years. By 1963, STMC extended area service so that customers in Beulah, Level Cross and Westfield could call each other free. In addition, Mount Airy, Pilot Mountain and Dobson could also be accessed. When STMC approached the middle part of the decade, membership totaled 2,790 customers and was growing. Customers who remember party-line service in the 1950s and 1960s almost unanimously agree the biggest and most welcome change in STMC’s history came when the company replaced shared party lines with private telephone service that began in the late ’60s. Surry Communications started 1970 with a construction project of burying cable for private line conversion in the Westfield exchange. Just a year later, construction for private lines in Beulah and Westfield exchanges began. And also in 1971, STMC added a new exchange to its service area – Red Brush – with an announcement that Beulah and Zephyr exchanges would be the next to get private lines. At the 1971 annual meeting, Manager John M. Smith said, “The cooperative’s goal for 1971 shall be the completion of the final phase of an all one-party system-wide design begun in 1966.” But in 1972, we saw the first signs of what was to become the standard in telecommunications delivery. That year, STMC put into service the first digital loop carrier to provide dial tone. The digital age had officially begun. In 1973, STMC implemented 7-digit dialing on extended calling, and introduced Touch-Tone dialing. We were becoming more sophisticated with technology and welcomed the new changes. Before 1976 came to a close, five of STMC’s six exchanges had Touch-Tone dialing. As the 1970s came to a close, STMC was updating its service even more. In 1977, the first digital concentrator was put into service, and by 1978, toll service was upgraded with new electronic trunks. For Surry Telephone, Dec. 15, 1980 brought us to a new home. On May 17, 1981, the community was invited to an open house of STMC’s new headquarters on East Atkins Street. The new state-of-the-art facility set the tone for the upcoming advancements that were in the planning stages. At this time in STMC’s history, more than 7,000 customers received telephone service from STMC. It also marked the beginning of digital advancement when the first digital switch was put into service. In August 1984, STMC had installed the first fiber-optic transmission equipment that would later become the backbone of today’s local network. By the mid to late 1980s, STMC began a technology campaign that hasn’t stopped. In 1981, digital switching technology was first put into service. The Beulah and Westfield exchanges were completed in 1987. Surry Communications opened the 1990s with three important changes for customers. In July 1990, equal access to long distance providers was offered, allowing customers to choose their own carrier. In September 1991, cellular phones were introduced through Carolina West Wireless. Perhaps the most exciting change to take place in 1992 was the introduction of car phones. Utilizing 10 tower sites, the new service provided maximum coverage for a 6-county region. Plus, enhanced 911 service was provided for Surry County. One of the most important decisions in STMC’s history came in 1995 when the cooperative decided to offer direct local Internet access to our customers. Only a few inventions can claim to have revolutionized the world. The printing press, sewing machine, telephone and television rank among them. Most recently, computers and the Internet have profoundly altered how we work, how we learn and how we communicate. Today more than 5,500 customers count on us for the Internet service. The ’90s ended with the implementing of Broadband and an upgrade to the switching network infrastructure in 1999 – both designed to keep STMC a leader in rural telecommunications technology. For Surry Telephone, these early years of the 21st century have featured positive advancements for the community. In 2000, STMC added remote sites at CC Camp, Horseshoe Road and Prison Camp. Digital Subscriber Line (DSL) became available in July 2001, and just one month later, Surry Long Distance went into service. By 2003, Surry Telephone’s reputation as a quality and affordable provider caused many residents in Dobson to inquire and request service. Evaluation of their strengths and the opportunities that existed within the area, led Surry to form a subsidiary, Surry Telecommunications, (STI) which began offering services to customers in Dobson as a Competitive Local Exchange Carrier (CLEC). The key to success in the competitive market has been the ability to bundle services, offer outstanding customer service through continued employee training and convenient store locations. STI plans to continue their expansion of services into the competitive markets of Pilot, Elkin and Mt. Airy. 2004 opened the door for Surry Communications to become an owner in Visions West, a video service provider for Northwest North Carolina. In 2008, Surry will begin offering Surry TV, which offers customers the latest technology combined with the local, knowledgeable customer service. Surry’s investment in expanding television services includes deploying fiber to homes within limited geographical areas. First quarter of 2005 heralded news of Surry Communicatons agreeing to act as general management for a struggling Piedmont Telephone and thus providing accounting, engineering, monthly CABS and purchasing for Piedmont to be effective April 1, 2005. The arrangement continued through 2007 at which time studies indicated a redundancy in work functions being performed by both companies. At that time, the prevalence of competition entering the telecommunication industry required resources be utilized at maximum efficiency and economies of scales achieved for both companies. A study and search began for an arrangement that would create these efficiencies while being mutually beneficial to members of both cooperatives. In 2008, the Boards of Directors for both Surry Communications and Piedmont Telephone agreed to pursue plans to merge the two companies. During September of 2008, board meetings of Piedmont and Surry the proposed Position for Merger and Articles of Merger were considered and approved by each board separately. The proposal included a January 1, 2009 merger date with the surviving name of the merged companies to be Surry Communications Membership Cooperation. The resolutions called for a Special Meeting of the Memberships of both companies to be held for the voting of the proposed merger. Prior to the Special Meeting of the Memberships, informational meetings were held to allow members to ask questions and learn more about the proposed merger. On Thursday, October 30, 2008 the memberships of both cooperatives voted to merge the two companies. Surry Communications continues to invest in the latest technology, thus allowing Surry to offer customers cutting-edge services. Surry recently installed a Soft switch thus allowing them to offer Voice Over IP (VOIP) and increasing efficiencies in traffic transportation.